The Eclipse Trip Continues North in Georgia - - PAGE 420. The Eclipse Trip Continues North in Georgia · · PAGE 420. 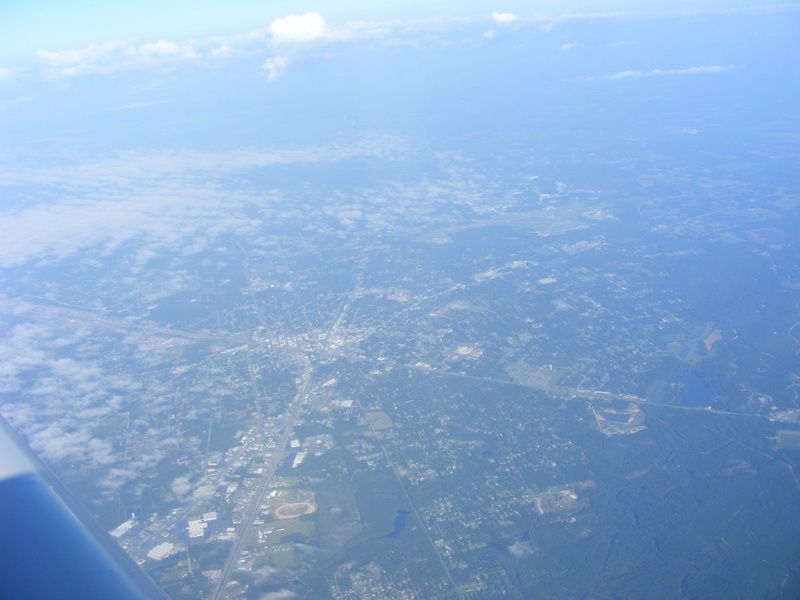 August 19, 2017: The low-level clouds associated with the front I passed near the Florida / Georgia state line are dissipating below to reveal the city of Waycross, Georgia. This photo was taken from an altitude of 10, 500 feet MSL at 9:17 AM looking west at the center of the city. Routes US 82 and US 84 are coming from the Georgia Atlantic Coastal areas on their long roads out west. US 1 is now inland from the ocean as it was in the last two counties in Florida. There are no big Interstate Highways here, but all those US routes are four lanes, but with cross roads at ground level. A couple of major railroad lines also cross here parallel to the highways. I did some photo processing on this image taken at 9:27 AM as I pass by the Alma, Georgia airport where I have refueled a number of times traveling between Chattanooga and Florida. The best fuel price today is at the Hazlehurst, Georgia airport north of here on US 23 and US 341. My last GPS waypoint from this morning's flight was recorded at 9:38:46 AM Eastern time here at the fuel pumps. 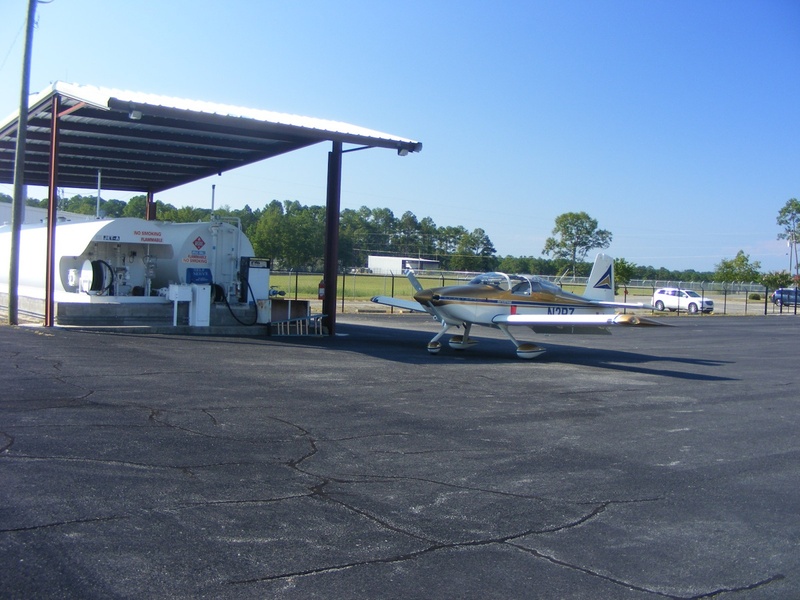 This picture was taken at 10 AM after getting fuel at the Hazlehurst Airport. There is a slight upward area on the ramp as you can see by comparing the top of the concrete slab for the fuel tanks with pavement where my plane is parked. I took advantage of that slope to get the fuel in the tanks as high as possible for the 36 gallons it can hold. I put in 20.7 gallons of fuel to take me to the Smithville Airport about EIGHT miles from the centerline of the Eclipse event in central Tennessee. No one was in the FBO office this Saturday morning. I did not go looking for anyone to say hello as I wanted to get on my way to Wendell's air field. I sat down in the airplane to call him and found I had NO CELL SERVICE on both of my phones. I pulled away from the pumps for the engine run up tests. The GPS data point when I entered the runway for takeoff was stamped at 10:10:38 AM. 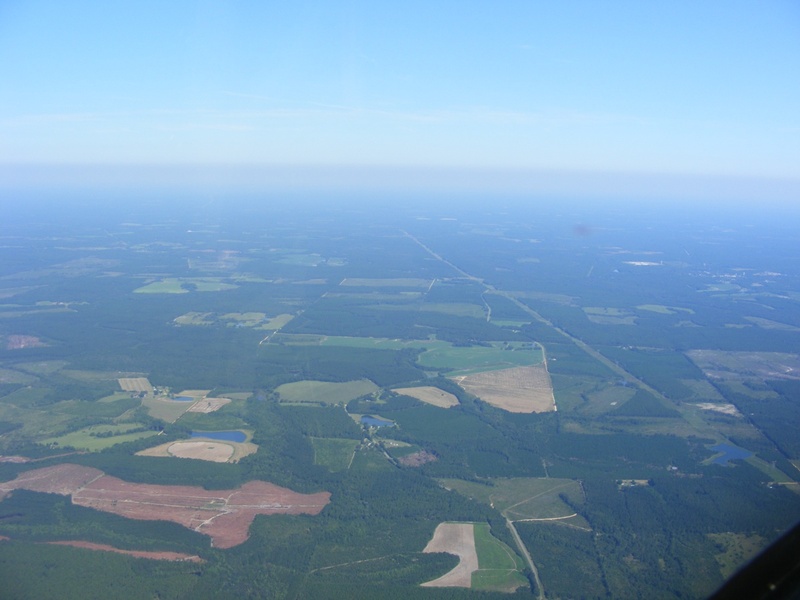 I am East of McRae, Georgia at 10:17 AM for this photo looking WEST as I climb through 3,700 feet MSL. The elevation of the land below is about 300 feet above mean sea level. The landscape is much the same on the other side of the airplane looking NORTH in a photo taken just seconds after the one above. My airspeed in the climb is about 135 MPH. 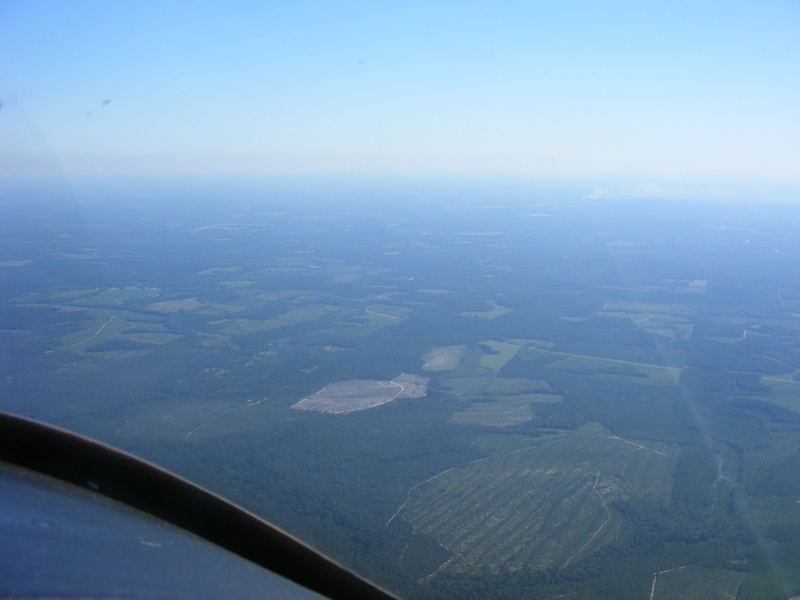 The haze and smoke from a fire dominate the view ahead in this high-pressure weather area of south central Georgia. This image was taken at 10:19 AM with the little town of Alamo, Georgia at the right side of the photo. My altitude is now at 4,500 feet as I continue the climb. 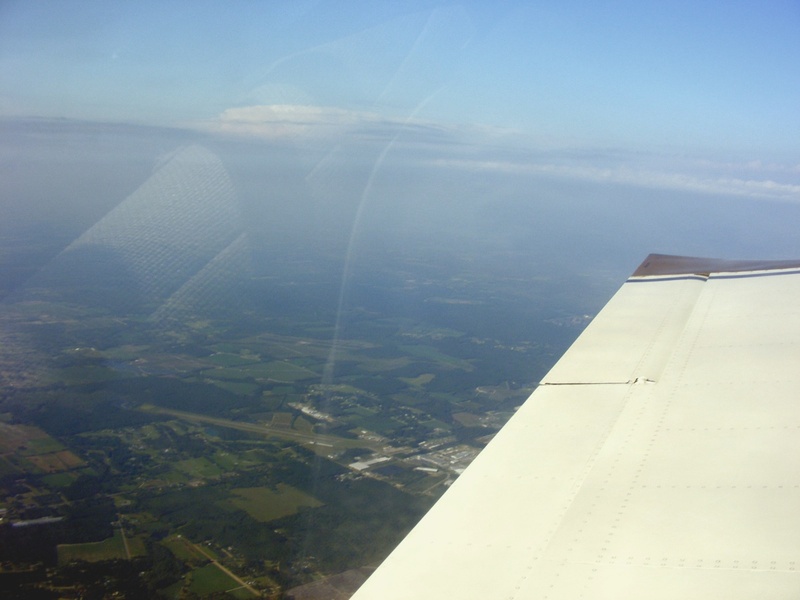 The Dynon is showing a favorable tail wind again as I continue north with nearly full fuel tanks. That is Milledgeville, Georgia out there on US 441 as I pass by on the East side of town at 10:51 AM. 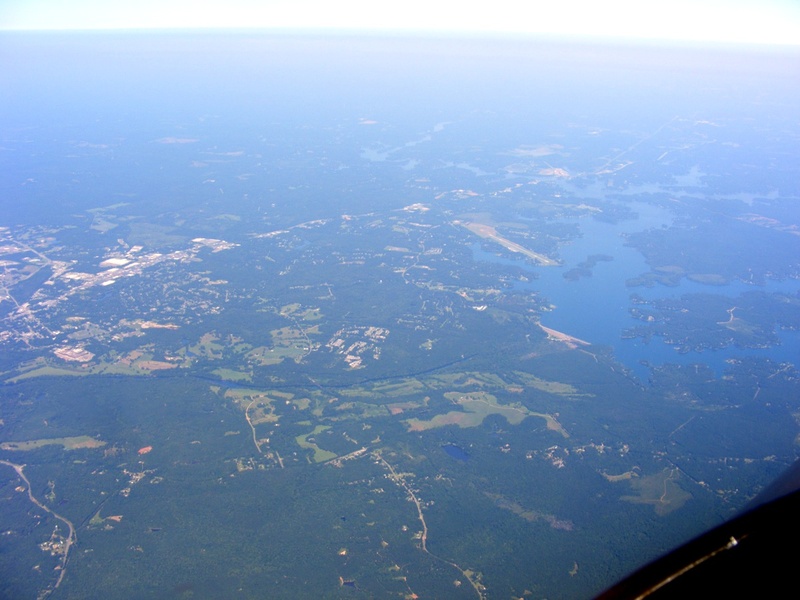 This is the first of three images showing Lake Sinclair from an altitude of 10,500 feet MSL. This area is part of the Piedmont, a range of hills and valleys between the coastal plain and higher elevations in north Georgia. The land below my flight path is about 570 feet above mean sea level. I have processed this image to get a better contrast down through the haze. The Oconee River flows south from the dam on its way to join the Ocmulgee River from Macon on its way to the Atlantic Ocean on the Georgia coast. My ground speed in this area is averaging between 150 to 160 MPH as the favorable tail winds are fading slowly. There are no clouds ahead at this altitude for at least 100 miles. Those wispy clouds out there are high cirrus layers up where the big jets fly their cross-country routes. 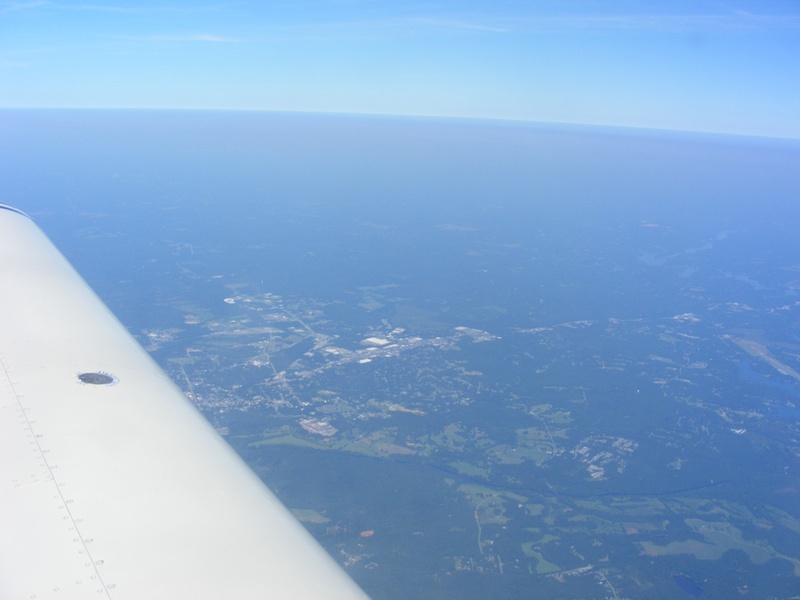 This raw photo shows how much haze is below my 10,500-foot cruising altitude. 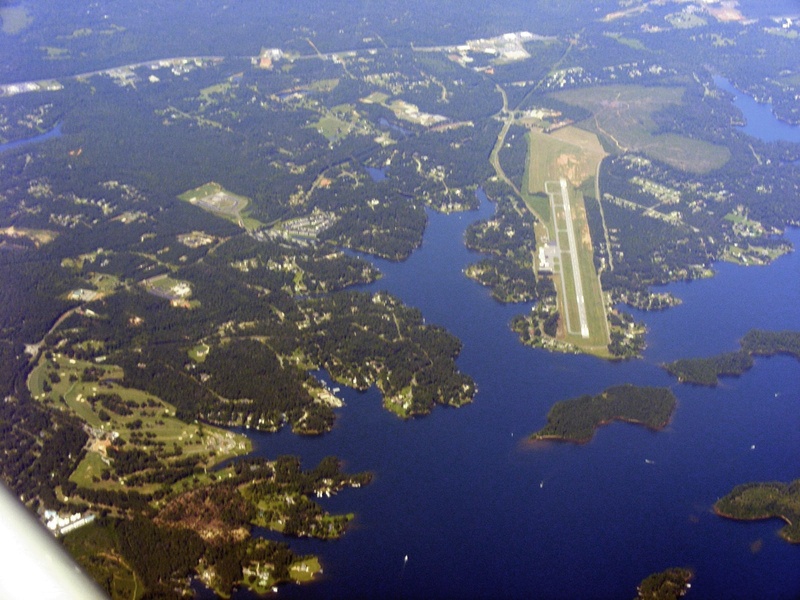 The dam holding back Lake Sinclair is visible along with the Milledgeville Airport. The airport field elevation is 390 feet MSL. 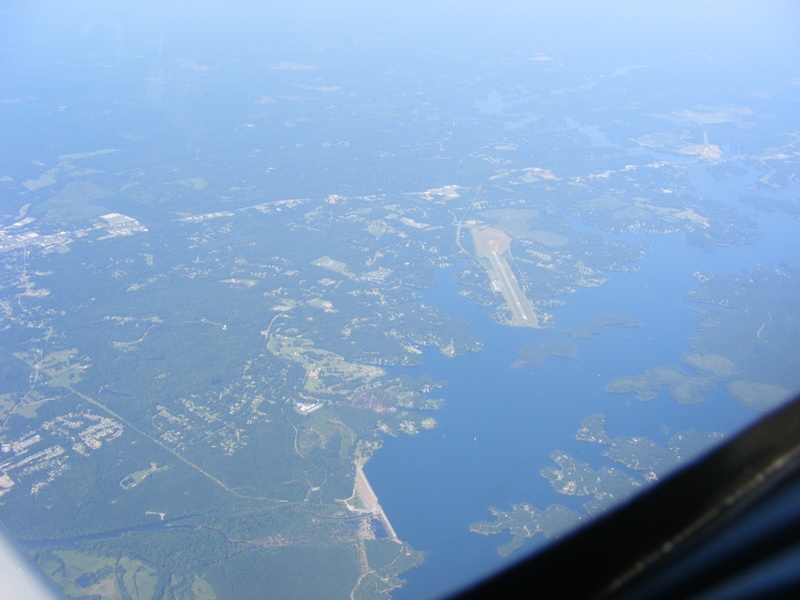 When I passed here, I was listening to the Atlanta Approach controllers to pass the time until I got near Monroe, Georgia. 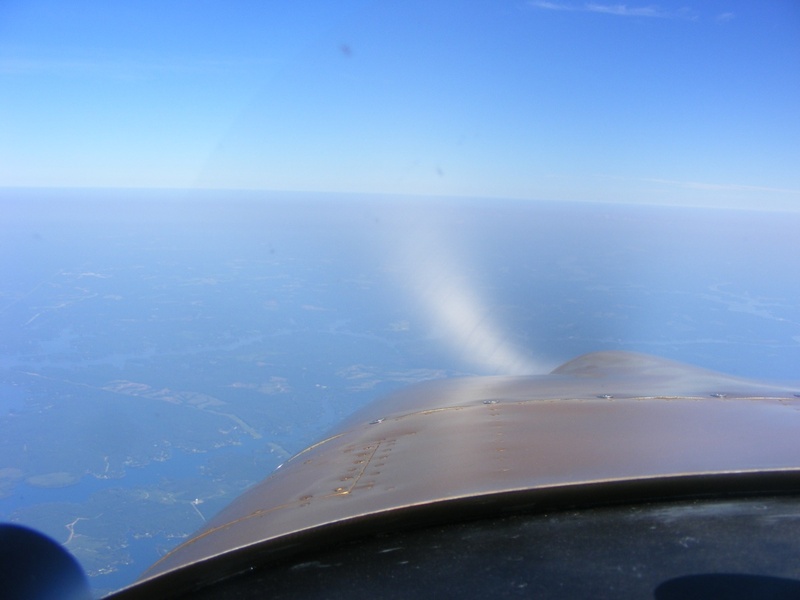 My ground speed at 10,500 feet dropped to 140 mph against headwinds. I started descending to get more speed going down to find more favorable winds. 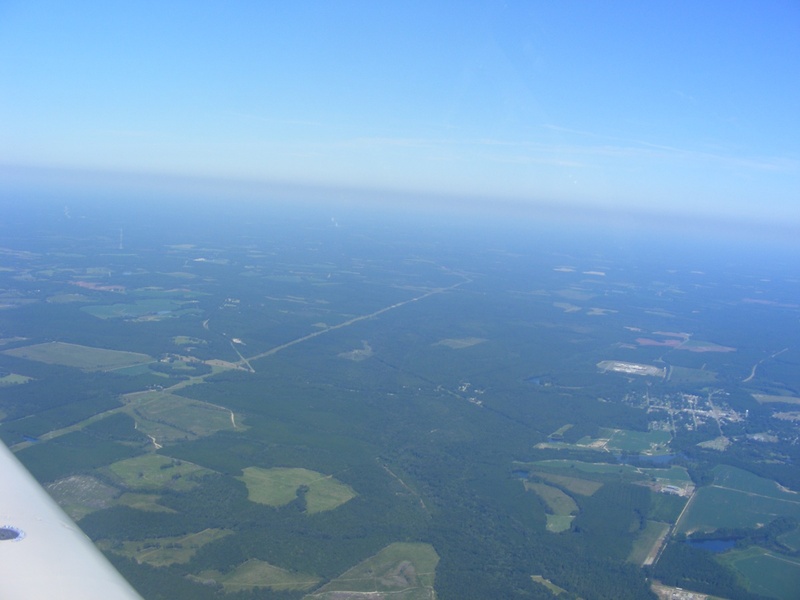 I descended down to 3,500 feet MSL trading altitude for ground speed while monitoring the winds aloft that finally became cross winds instead of head winds as I turned northwest near Lake Lanier located northeast of Atlanta and outside the Class B airspace. 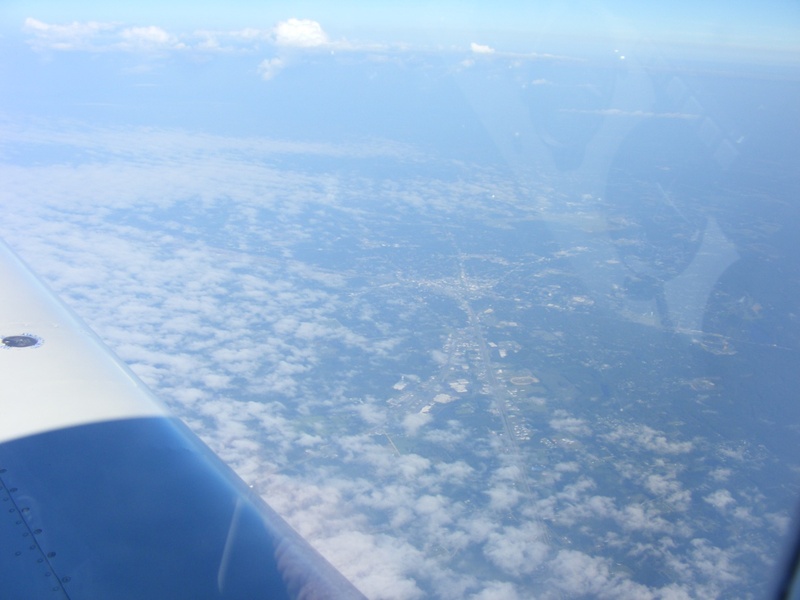 This image below was taken from 10,500 feet and has been processed to show more natural colors to minimize the blue tint from the hazy atmosphere below me. August 19, 2017: When I turned on my personal cell phone at 12:06 PM, Wendell called me as it got booted up to the AT&T cell tower nearby. His wife called him as soon as I landed to let him know I had arrived. Wendell and his friends had left for lunch in Chickamauga about five minutes before I landed. Wendell's wife gave me a set of car keys to take their Lexus over to the restaurant where I have been before. As always, the group had questions about my plans to fly up to see the Total Eclipse in central Tennessee. 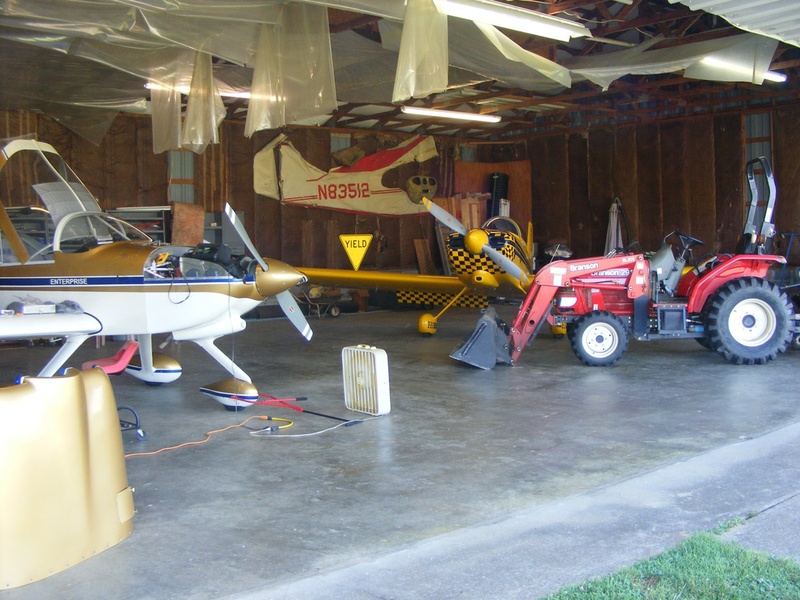 After returning from lunch, Wendell moved things around in the hangar to get my airplane inside until my Monday morning departure. The remainder of Saturday was spent unpacking the airplane for the things I needed over the weekend. 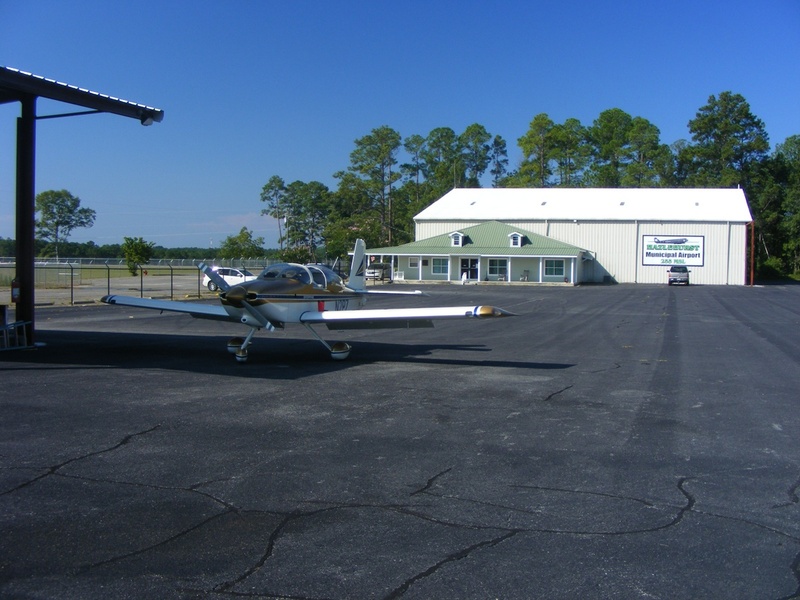 His air conditioner for the upstairs guest rooms was out of commission and I was set up in the motor home parked in the garage adjacent to the hangar. My T-Mobile cell phone connected to my computer USB port for 30 MB speed to the internet. A shower in the house was much bigger than the one in the motor home. The dining table in the rig became my computer desk to keep close tabs on the weather for Eclipse day. The microwave would heat up my breakfast sausage biscuit on Sunday and Monday mornings. We all went to the Cracker Barrel restaurant over near where I used to live in East Ridge, Tennessee for our Saturday night dinner. It was my treat to show my appreciation for landing rights and an air-conditioned bedroom. August 20, 2017: Sunday morning I planned to clean up the inside and outside of the canopy and windshield to optimize the view of the Eclipse day activities. I discovered the master switch had been left ON when I had moved the airplane up near the hangar doors after lunch on Saturday and put the airplane inside by hand. 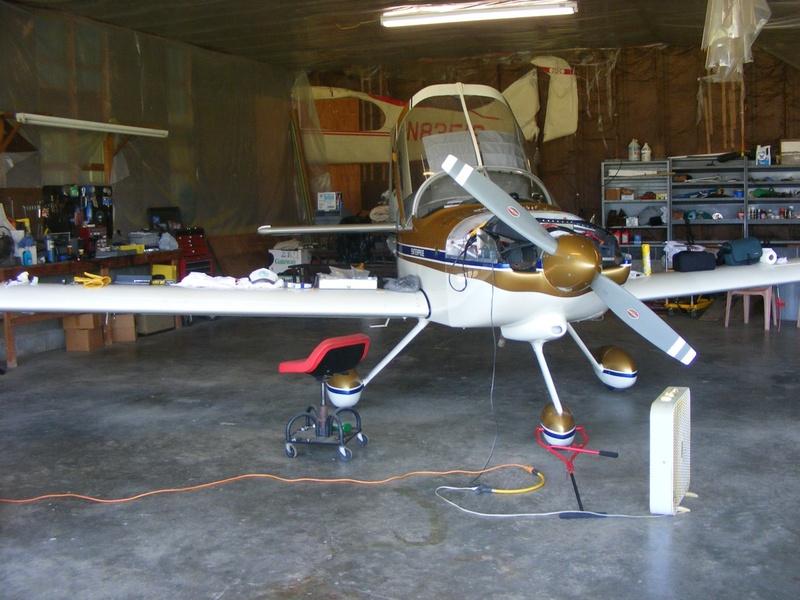 I had to take the top of the cowling off to get to the main battery which only had about 3.5 volts on it before I hooked up the battery charger to bring it back to full capacity. 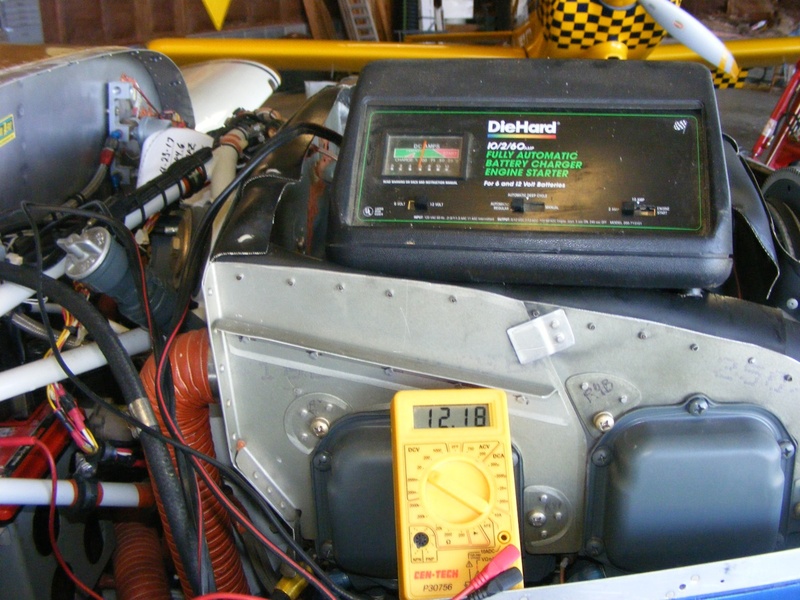 I set about doing my cleaning of the canopy and windshield and watched the battery voltage slowly increasing. 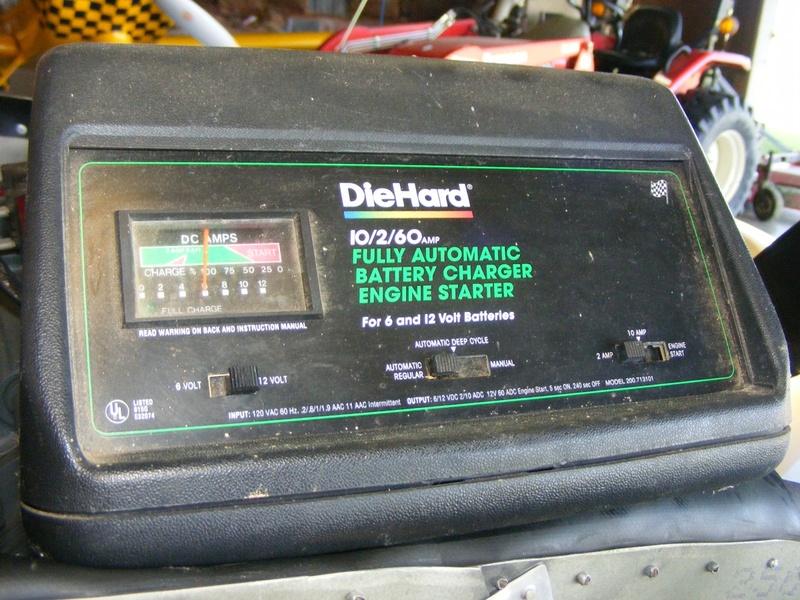 When the battery voltage reached about seven volts and dropped back a bit, I realized the controls on the charger were set for 6-volt batteries. I set the switch on the charger from 6-volts to 12-volts and my voltmeter reading jumped to over 10 volts as it continued to charge. It was not long before the battery voltage exceeded 12 volts DC. There is a GREEN LED on the charger that illuminates when the battery is fully-charged. I cleaned all the bugs off the airplane on Sunday afternoon before the bright sun came in through the open hangar door to raise the temperature higher in the hangar.